I’ve been on this kick of baking lightened up versions to some of my favorite baked goodies. I’ve tried Light Chocolate Chip Cookies, Light Chocolate Chip Muffins, and Light Fudgy Brownies. There are a lot of ways to lighten up a recipe and if you are like me then you are wondering if those ways actually work. The age old question… Can lighter recipes really deliver a healthier outcome that still tastes just as good as the real deal full fat one? The answer is absolutely yes, if you have the right recipe. Trial and error, my friends (hopefully less error). I’m adding to my growing list of “healthified” baked goodies with this low fat and low calorie banana bread. Not only does it taste amazingly delicious, I love it MORE than the real deal. In a medium bowl, whisk together the all-purpose flour, 1/4 cup of the white sugar, cake flour, baking powder, baking soda, and salt. Set the dry ingredients aside. In a small bowl, mix the mashed bananas, yogurt, and vanilla extract together. Set the banana mixture aside. 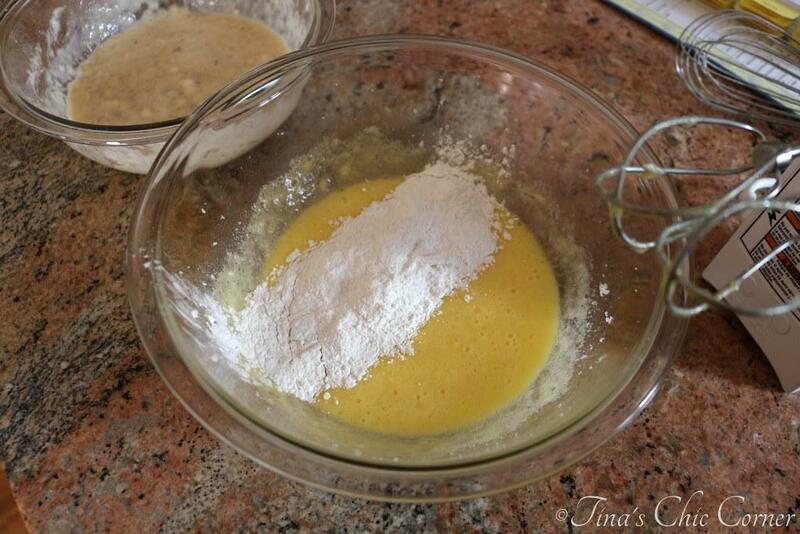 In a large bowl, cream the remaining 1/2 cup of sugar and butter. Mix in one third of the dry ingredients and then half of the banana mixture. Then mix in another one third of the dry ingredients and then the remaining half of the banana mixture. Last mix in the remaining one third of the dry ingredients. Do not overmix. The batter will look thick and chunky. Sprinkle the chopped pecans on top of the batter. Bake in the preheated oven for 55 minutes or until a tester inserted comes out clean. Let the loaf cool in the pan for about 10 minutes and remove it from the pan onto a wire rack to cool completely. Let’s get down to brass tacks. Like with my other light recipes, it’s virtually impossible to do a true side by side comparison of where you are saving fat, calories, sugar, etc. because there are tons of recipes out there. However, I can compare this recipe to my Classic Banana Bread recipe. This recipe contains over 60% less butter, 50% less nuts, and 25% less sugar. I think those numbers are impressive. Especially considering this has now replaced my favorite banana bread. Thanks to the bananas and their amazing texture and seemingly endless supply of delicious moisture, you really can get away with using way less butter. Greek yogurt? Yup, as I’ve said many times before, it’s a great ingredient to use to help maximize the moistness while minimizing the fat. Half as much nuts? I don’t know about that, T. If you’re not adding anything fun like chocolate chips, won’t this be boring? Nope. The oven toasts the nuts on top of the bread so the flavors are intensified. Meaning you can use less of them and they still convey virtually all the same crunch and flavor as in the real deal bread. Now to the real question that I’m sure everyone wants to the know anwswer to… Drum roll, please… Does this taste good? I know I’ve said this a couple times already, but I actually like this lighter banana bread better than the real deal. (My husband agrees.) It tastes identical to the high test version, except that this has a lighter texture, which is what I prefer. My youngest sister also tried and loved this banana bread. She had no idea it was a “light” recipe. Sweet! Have you lightened up a classic recipe? If yes, what was it and how did it turn out? 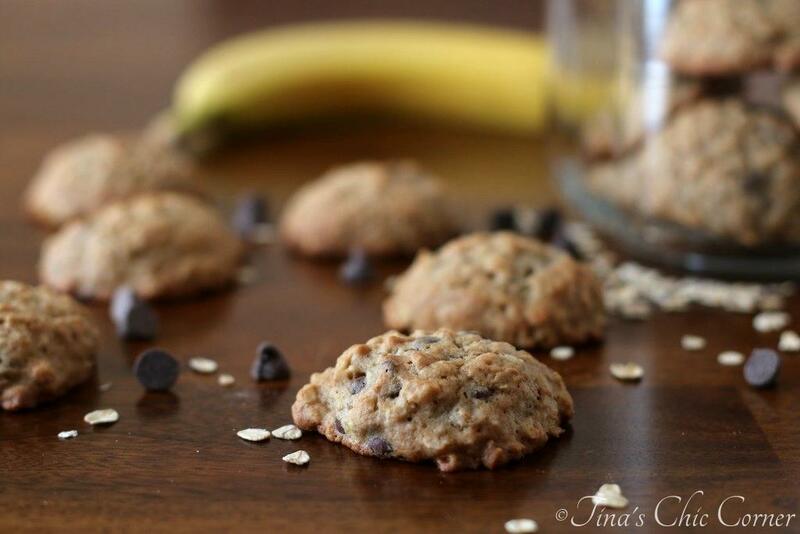 Here are some other delicious banana recipes. I totally agree – healthier baked goods can taste great … with the right recipe! I stayed away from them for so long until I realized it was the recipes… haha This looks great! And a delicious breakfast option too : ) I need some new ideas … in such a rut! This banana bread looks delicious! Love that you lightened this up! So true! A good recipe is key. My Mom says anyone can be a good cook/baker with the right recipes. And I also agree, healthier foods require a lot more trial and error! 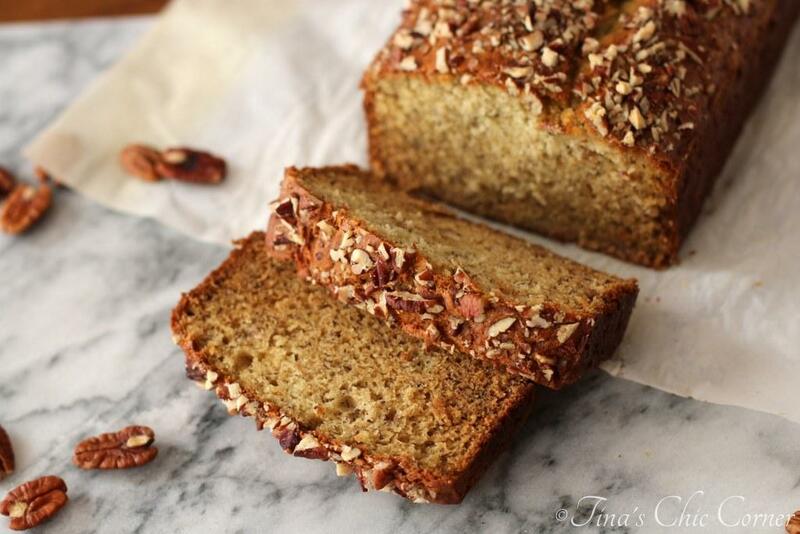 Loving this quick bread, especially the triple banana! 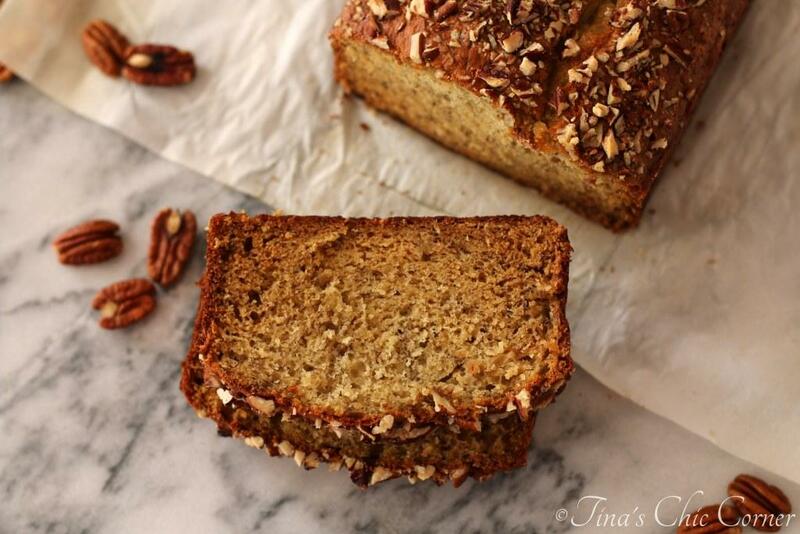 Love the pecans in this Tina! I know nuts in banana bread is nothing new, but I hated all nuts as a kid so sometimes when I see them in normal-nut-including recipes I’m like hey! Pecans! That sounds awesome! I love a good healthy banana bread recipe, and yours looks fabulous! Banana bread is the best kind of comfort food. Must try this! Don’t you love when you lighten up recipes and you end up loving the taste more than the original? Such a bonus! 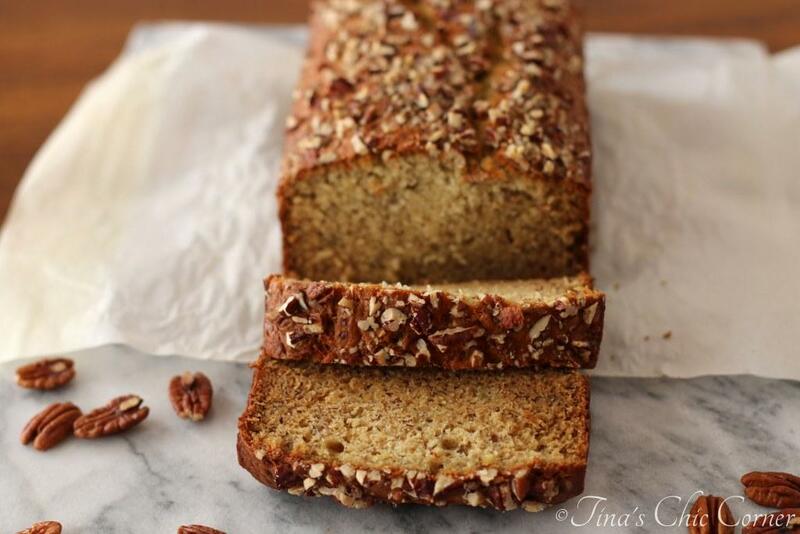 This looks delish – and we love banana bread! Awesome that you like this better than traditional banana bread! This is a good recipe to lighten up because the bananas provide to much moisture. 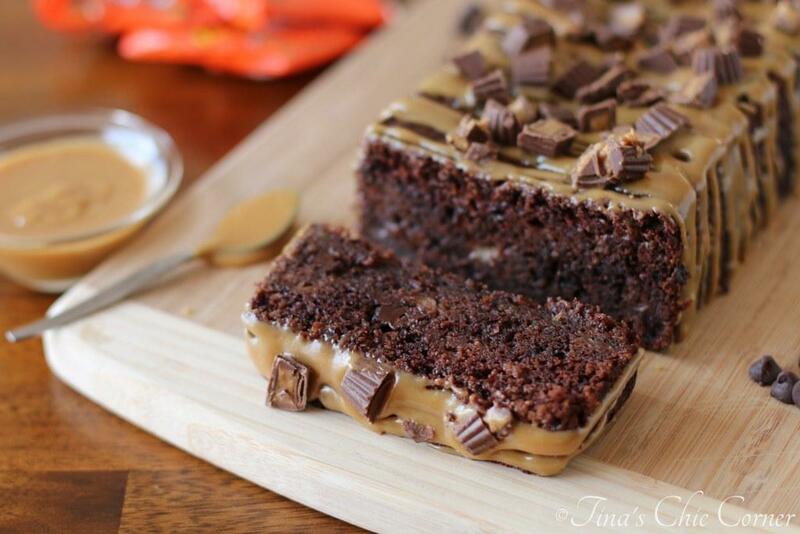 This sounds amazing, Tina! You cannot beat a good slice of banana bread! Hi. Returning the love. Appreciate that you stopped by earlier! Happy you did as now I will make certain to follow your social media. I love to bake — usually chocolate, of course, but need the healthier versions in my life, too. Thank you so much for you kind compliments. 🙂 I’m with ya, chocolate rules! Loving all your lightened up recipes! Such a great idea, especially as we approach pool/beach season! What a great idea to add greek yogurt! 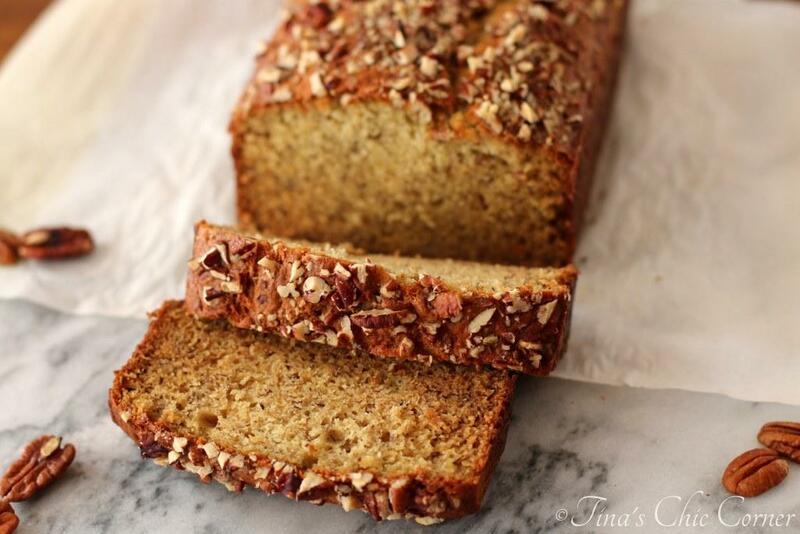 I love banana bread – and you know I like to try to make things lighter! This is such a great recipe! Love the addition of Greek yogurt! Pinned! 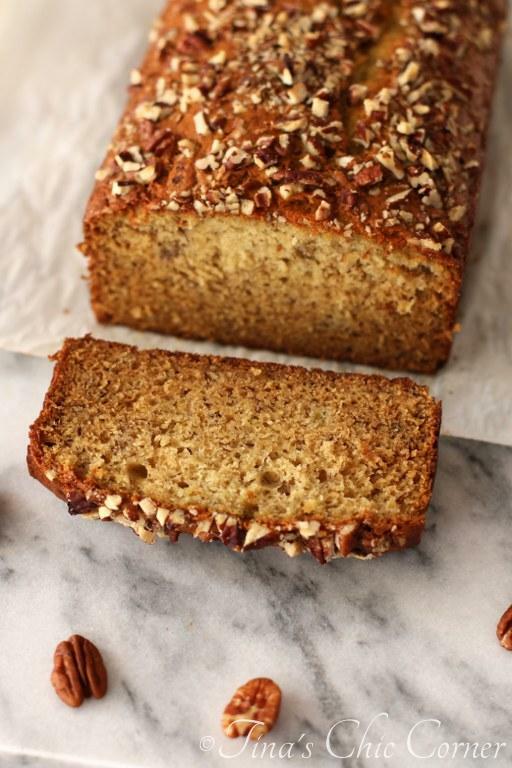 This lightened version of banana bread looks delicious! I lightened mine up a while ago and found that we liked it just as much…or even more!! How many choc chips would you add to the light banana bread recipe. And is it safe to double the recipe upfront or should I make two separate batches. And what kind of a knife would you use to slice the finished masterpiece ? Thanks so much. Since you are making the light version then you may want to reduce the amount to keep it on the lighter side. I personally do not like to double a quick bread recipe. I find that I have better luck making 2 separate batches. I always use a serrated knife to cut my quick breads. It’s the kind that has the scallops or bumps/ridges on the edge of the knife. I find that this type of knife cuts the bread better and doesn’t tear at it. I hope this helps!